When I returned to the Mac after wandering in the Windows wilderness for a couple of years, Quicksilver was one of the first apps I downloaded. The primary reason: I wanted a quick way to launch any of my applications or documents from the keyboard. Of course, that still left me with several alternatives, LaunchBar ( ) and Butler ( ) among them. But I chose Quicksilver, largely thanks to the reputation it had acquired among some productivity geeks I knew and respected. Now Quicksilver ( ; free) is the Application I Can Not Live Without. Like LaunchBar and Butler, Quicksilver is first and foremost an excellent application launcher. It loads when I log in, then sits quietly in the background until I hit Control-spacebar to invoke it. (I switched to that combo from the default Command-spacebar, which OS X’s Spotlight has appropriated.) After Quicksilver pops up, I start typing and it starts finding stuff—applications, documents, iTunes tracks, Firefox bookmarks, and anything else on my system I’ve told it to catalog—whose names match that text I’ve typed. Like Launchbar, Quicksilver is adaptive, meaning it learns my preferences the more I use it. The first couple of times I type EX, for example, it might think I want to open up my expense report form. But by hitting the right arrow key, I can choose from a list of other matching items. Over time, as I repeatedly select Microsoft Excel from that last, Quicksilver learns that EX means Excel and starts offering that first. 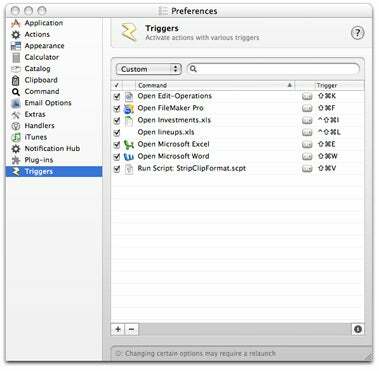 If hitting Control-spacebar then typing two or three letters is too much work for you, Quicksilver lets you program QuicKeys-like keystroke triggers to launch specific applications and documents. It’s also extremely extensible. You can get Quicksilver plug-ins for everything from Adium to Transmit FTP, including OS X’s own Address Book, iChat, iPhoto, iTunes, Mail, Safari, and Terminal. As a result of all this flexibility, I use Quicksilver instead of Spotlight. (It doesn’t search metadata, but if I know the name of the file I need, Quicksilver is way quicker.) I also use it instead of the Finder, as it lets me quickly navigate my doc folders without ever leaving the keyboard. If I really wanted to, I could even use it as a front-end to Firefox (as noted, it catalogs my bookmarks), iTunes, Entourage—pretty much everything I use. Quicksilver is one of those freeware program that seems to be in a permanent state of beta testing (it’s currently at release number 48). But except for a slightly hinky Halloween-themed version that appeared for a few weeks last fall, it’s been rock-solid for me for months. As for comparing Launchbar, Quicksilver, and Butler, there are plenty of little differences. For example, unlike Launchbar, Quicksilver won’t let you easily scan through a list of open recently used files when you select an application. But it does some nifty things with plain text that Launchbar can’t. 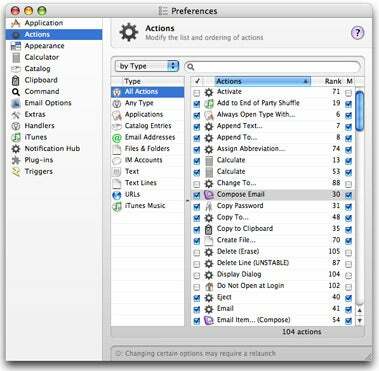 Those subtle differences aside, though, let’s be frank: Quicksilver, Launchbar, and Butler each do roughly the same things, and the choice between them is more a matter of subjective preference than of objective comparison. Like e-mail clients, text editors, and Web browsers, launchers are very personal. They either fit the way you work and think or they don’t. Once you choose one and use it for a while, switching to another becomes almost unthinkable. Which is to say that, if you’re a Launchbar or Butler user, there’s probably little reason to switch to Quicksilver. But if you’re not using any of them, you should be. And, if you asked my advice, I’d tell you to try Quicksilver first. But I’m not going to try to argue that it’s your only worthy option. Just because I can’t live without it doesn’t mean you can’t.